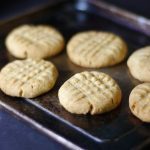 These scrumptious vegan gluten-free peanut butter cookies are perfectly soft on the inside and crunchy on the outside. Also refined sugar-free and oil-free. 1. Preheat oven to 375F. Line a cookie sheet with parchment and set aside. 2. Process all cookie ingredients in a food processor until the mixture begins to form a ball*. Form the mixture into a ball with your hands and knead briefly. 3. Tear off about a 1½ – 2 tbsp of the dough (a ⅙ of the total amount) and roll into a little ball with your hands. Place on the prepared cookie sheet. Repeat the process with the remaining dough until you get 6 dough balls. Space them out a few inches apart on the tray. Use a fork to press down each cookie ball to flatten it, first going one way, then the other to form a criss-cross pattern. 4. Bake in a pre-heated oven for approx 10 mins until the cookies become nice and golden. Remove from oven and cool the cookies on the tray on a wire rack (they’ll firm up a touch as they cook). Enjoy! *The texture of the dough can be different depending on the peanut butter used. For example sometimes you might get a batch that’s more “oily” other times one that’s more dry + brands vary, etc. The dough should be soft and pliable. But if the mixture feels too sticky at this point, add a bit more flour (1 tsp at a time) and process again to incorporate; if too dry, add a bit more maple syrup.